I loved this Slow Cooker Parmesan Meatballs in BBQ Pineapple Sauce entree. 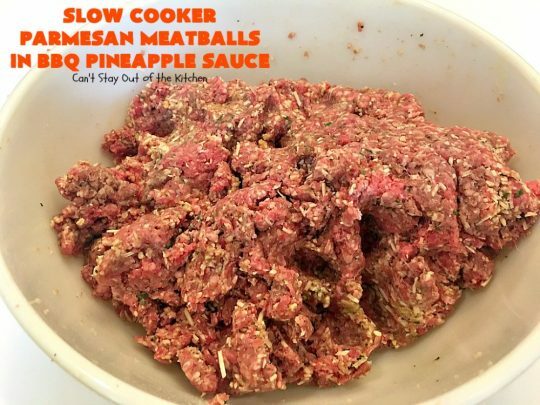 I made homemade gluten free meatballs with parmesan cheese and tossed them in a crockpot with BBQ sauce, a can of chunk pineapple and a chopped red bell pepper. That was it. It was easy and delicious served over rice. Earlier in the month I pulled a large package of ground beef out of my freezer. I only needed part of it for the Tex-Mex recipe I made. So I was trying to figure out a way to use up the rest of the beef. 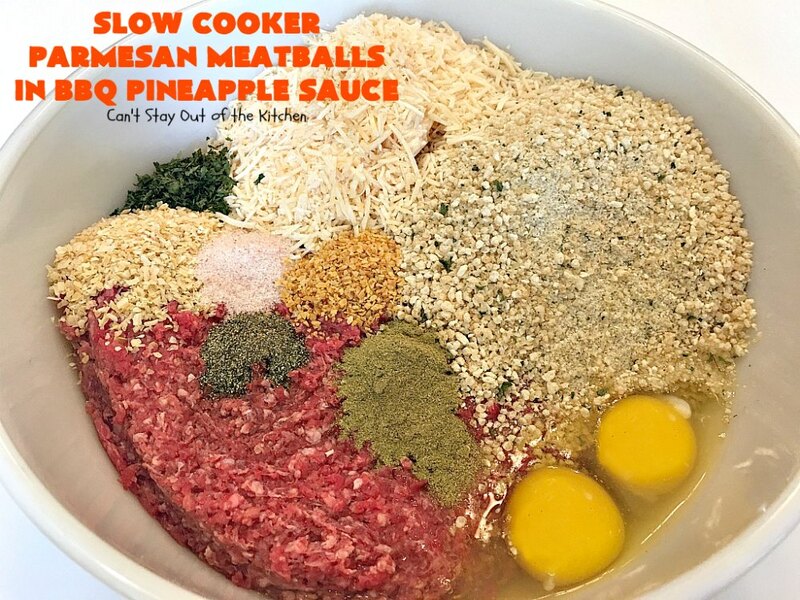 Meatballs are one of those comfort foods I love so much, so I decided to try a new spin on meatballs based on my Slow Cooker Cocktail Meatballs and my Waikiki Meatballs recipes. One of those uses pineapple and bell pepper and the other one uses BBQ sauce. I thought the combination would be delicious, and it was! This recipe can just as easily be made with freezer meatballs from Costco or any other grocery store. Those meatballs (while convenient) are never made gluten free. So because I always look for gluten free options, I made up my own meatballs with gluten free bread crumbs, dehydrated onion and garlic, parsley, thyme, eggs and parmesan cheese. The meatballs only took about ten minutes to make and then I put them into the crockpot raw with the other ingredients. 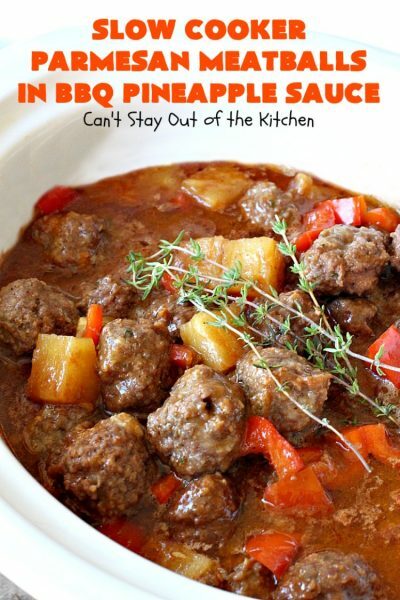 I do recommend that you use only a 96% lean ground beef if you don’t precook the meatballs. That way you won’t end up with a lot of grease floating to the top after the meatballs cook through. I chose a BBQ sauce without high fructose corn syrup and preservatives. Since it already had sugar, and the pineapples in juice would be sweet, I didn’t feel like the recipe needed additional sugar. (And it didn’t). While I served the entree over rice, you can just as easily serve this as an appetizer for parties and potlucks. I had this recipe ready to go in the crockpot in about 15-20 minutes. I cooked the recipe on high for about 2 hours and that was it. I served it over top of rice and enjoyed it for lunches for several days after the original dinner meal I made it for. This recipe makes about 56 meatballs – enough for 8-10 hearty appetites. So if you aren’t interested in having extra’s you can easily cut this recipe in half. 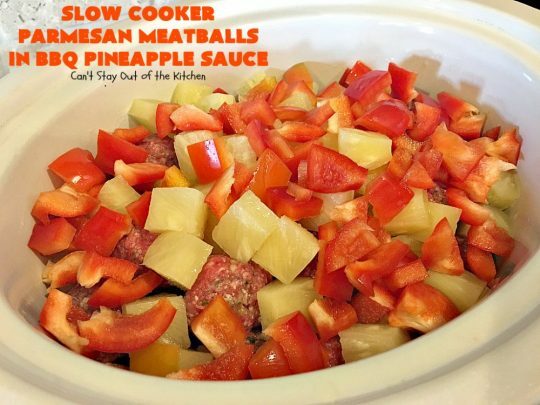 If you want a simple, easy and delicious dinner meal that’s made in the crockpot, this Slow Cooker Parmesan Meatballs in BBQ Pineapple sauce should be on the menu. 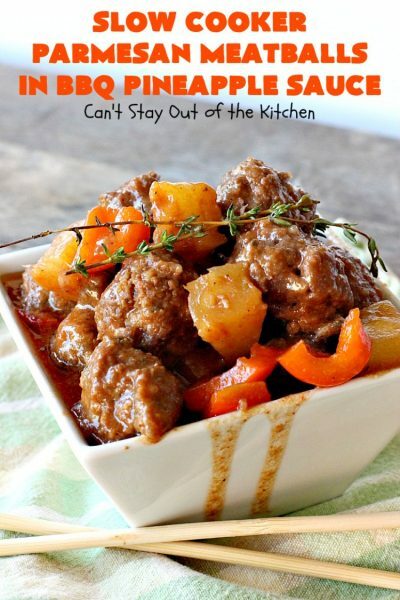 It has all the sweet and sour flavors you’ll love. Plus, it’s one of those hearty, satisfying comfort foods that’s terrific any time of the year. 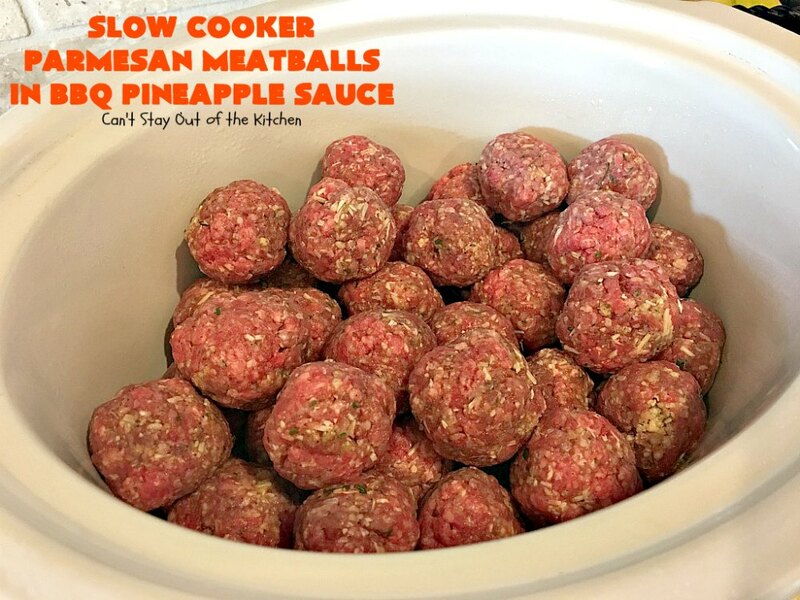 Slow Cooker Parmesan Meatballs in BBQ Pineapple Sauce is one of those comfort foods I really enjoy. This recipe is terrific served over rice. 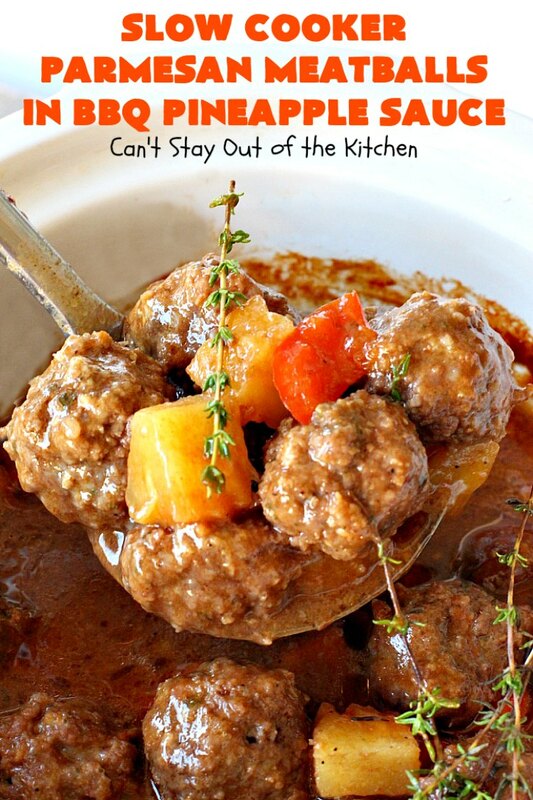 If you enjoy meatballs like I do, you’ll love this recipe. I used these ingredients. 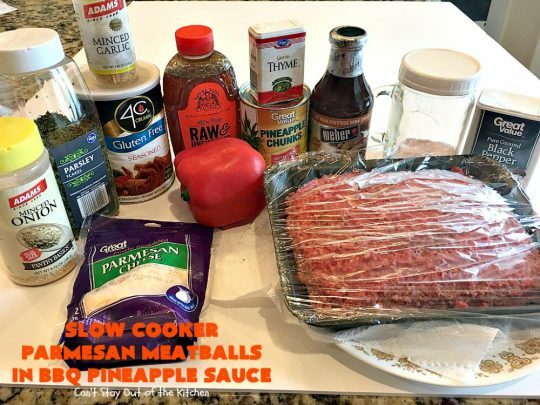 While I made homemade meatballs because I wanted to make this recipe gluten free, you can use pre-made meatballs if you desire. Place ground beef in a large mixing bowl. Add gluten free bread crumbs, parmesan cheese, eggs, dehydrated onions, dehydrated garlic (or use fresh), thyme, parsley, salt and pepper. Mix with your hands until thoroughly mixed together. 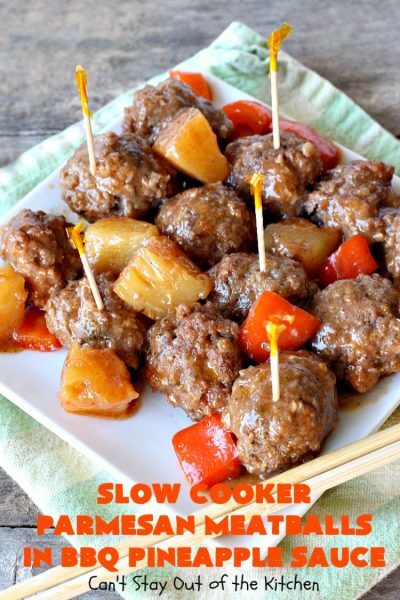 Roll meat into balls and place in a crockpot. 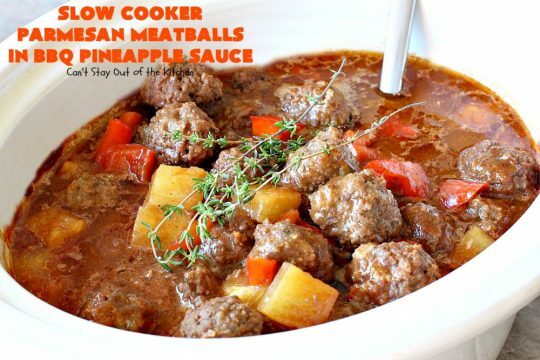 Add a can of undrained pineapple chunks and a chopped red bell pepper. Add barbecue sauce. I chose one made without a lot of the preservatives or high fructose corn syrup that many BBQ sauces have. Cover with lid and cook about 2 hours on high. About 30 minutes before the meatballs are cooked through, begin cooking rice. 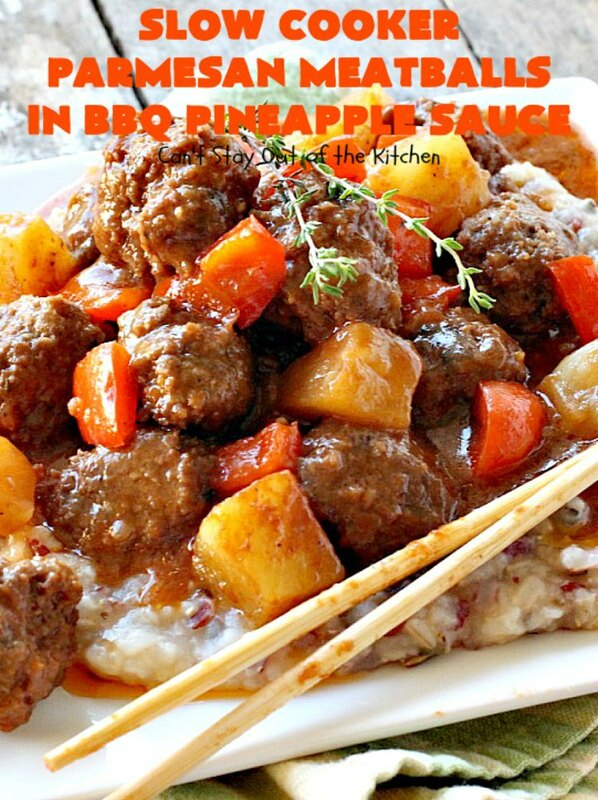 Serve Slow Cooker Parmesan Meatballs in BBQ Pineapple Sauce over hot, cooked rice. I loved the flavors of the BBQ sauce when it was diluted with the pineapple juice, pineapple and bell pepper. If you’re cooking for a crowd, this recipe will easily serve 10 hearty appetites. The thyme and parmesan cheese really added to the flavor of these meatballs. This fantastic meatball recipe is made with gluten free bread crumbs and parmesan cheese. 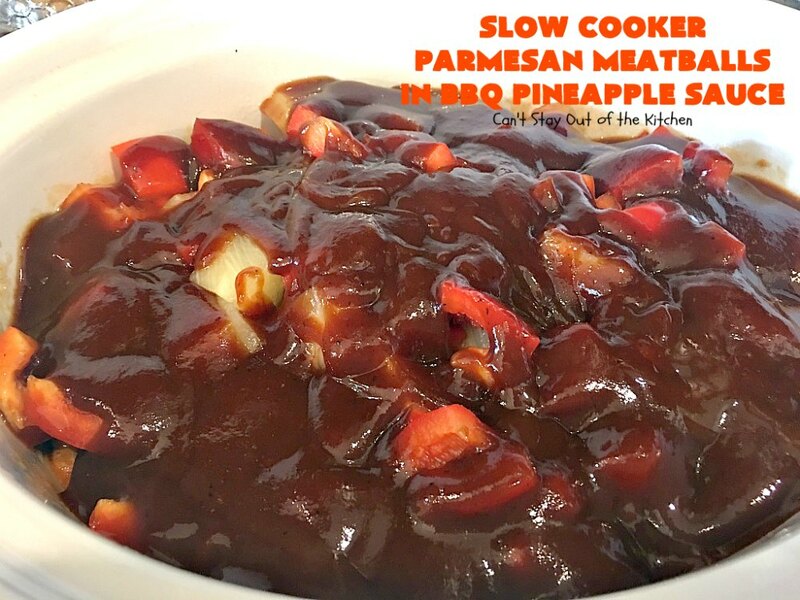 Then it's cooked in the crockpot with barbecue sauce, pineapple chunks and red bell pepper. It's terrific served over rice. 1 1/2 to 2 lbs. 96% lean ground beef (Do not use a higher fat content beef or you will end up with too much grease). Combine ground beef, bread crumbs, eggs, parmesan cheese, parsley, thyme, salt, pepper, dehydrated onions and minced garlic in a large mixing bowl. With your hands mix ingredients thoroughly. 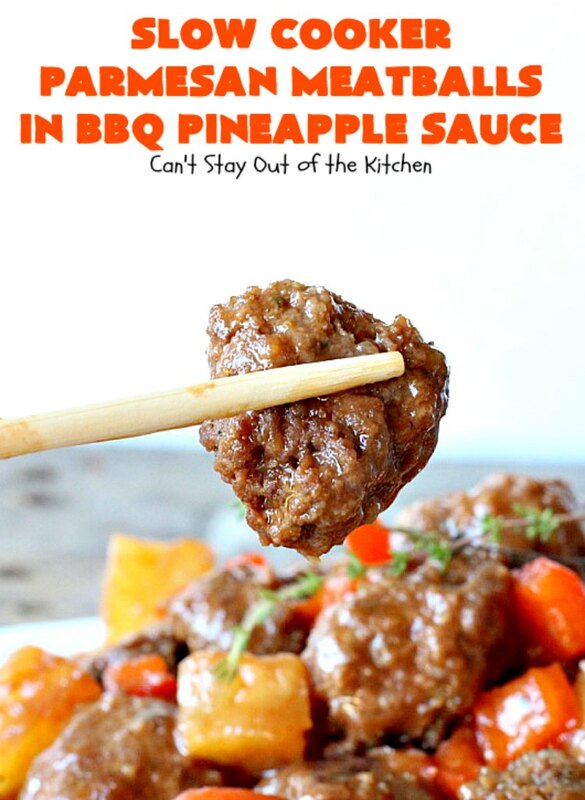 Add BBQ sauce, pineapple chunks with juice and bell pepper. Cook on high about 2 hours or until meatballs are done and heated through. Yield: 56 meatballs or about 10-12 servings. NOTE: Do not use a beef under 96% lean or you will end up with too much grease after the meatballs cook. 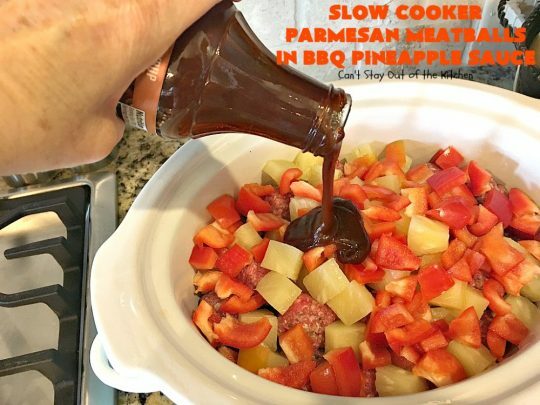 If you’re looking for a tasty recipe that you can serve in a few hours, this one is easy and delicious. If you need to make this a 30-minute meal you can cook the meatballs on top of the stove, drain the grease and add the sauce ingredients. It’s yummy either way. Slow Cooker Parmesan Meatballs in BBQ Pineapple Sauce is a great gluten free recipe if you’re searching for delicious gluten free recipes. 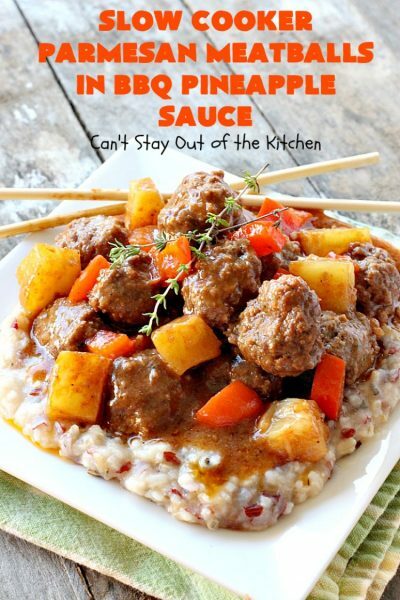 There is actually enough sauce in this recipe for twice as many meatballs! 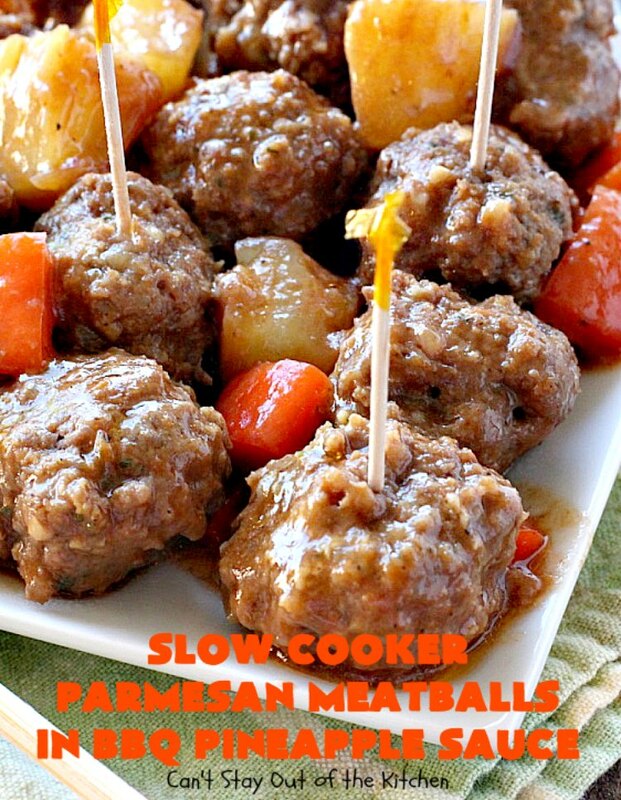 You can also serve these meatballs as an appetizer, if you prefer.